After 15 years’ with state government conservation departments (WA Museum, CALM, DEC), including as a regulatory advisor for terrestrial and subterranean fauna invertebrates, Brad decided it was time to move into consulting. Since this time, Brad stepped swiftly into a Director position and now manages the company alongside Morgan. After 15 years’ with state government conservation departments (WA Museum, CALM, DEC), including as a regulatory advisor for terrestrial and subterranean fauna invertebrates, Brad decided it was time to move into consulting. 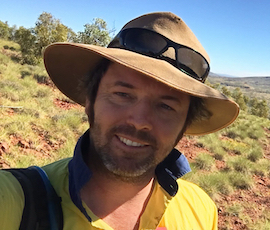 His decision to accept the position of Principal Zoologist at Biologic in 2011 to establish and manage the Invertebrate section is one he has never regretted. Since this time, Brad stepped swiftly into a Director position and now manages the company alongside Morgan.